Known for their quality reloads out of Central Indiana, Precision Cartridge, Inc. is offering this .357 Sig FACTORY NEW ammunition that is an excellent deal. The 125 grain total copper jacketed bullet offers good feeding and reliability. 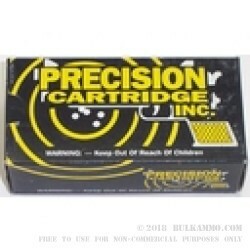 The company is famous for utilizing top performing components for the cartridges. Their reloading components used include a long list of the finest component producers in the world including Federal, MagTech, Remington, Hornady, Accurate Arms, Hodgdon, Winchester and others. This is a new box of ammunition. It is suitable for use in all firearms and it is a good general purpose round for mostly range and target practice use. 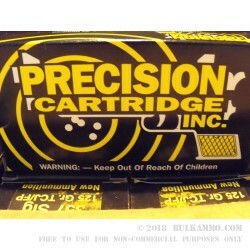 This ammunition represents a good price point for ammunition of this quality and of the performance level of this load. Precision Cartridge Inc. has many relationships with law enforcement and commercial shooting contracts that allow them to produce a lot of extra ammo. It is these relationships that have helped to build it into a brand name over the years. 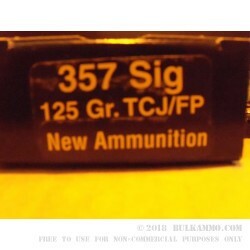 The .357 Sig is a potent round with high penetration, high velocity, and reliable function across the board. It has been adopted by several key law enforcement agencies in the past and continues to thrive due to its lethal nature.